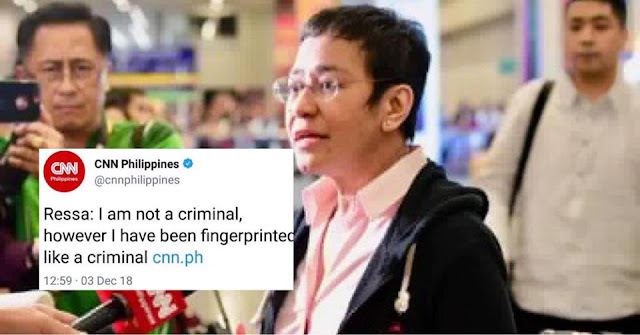 Maria Ressa continued her assault against the government for what she claims as legal harrassment, the latest of which was her tweet saying she was fingerprinted as a criminal. Lawyer Bruce Rivera slammed her for playing as the victim anew, at the expense of the truth and the country. 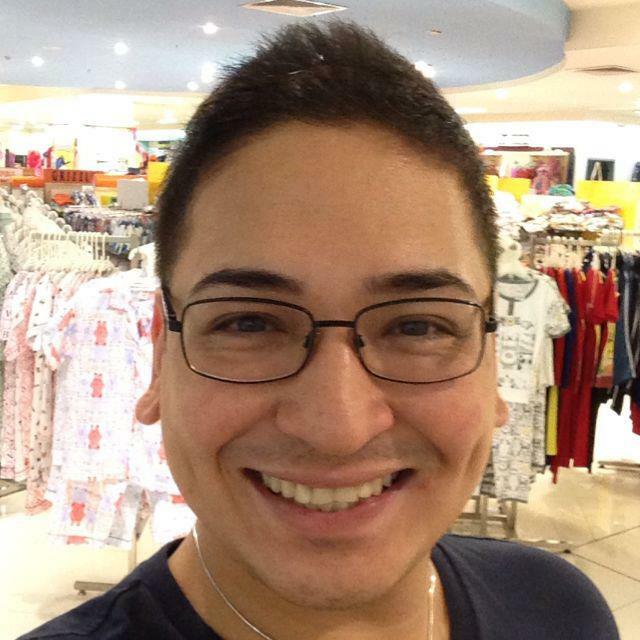 In a post he shared on Facebook, lawyer Bruce Rivera blamed Maria Ressa for her misleading statements. Just like anyone who is accused of an offense, Ressa is not exempted for fingerprinting. And it doesn’t mean she is a criminal, it only means she is an accused, with a presumption of innocence. Rivera further said that even innocent ones get to be fingerprinted. Despite her claims that she was being harassed by the government, Ressa felt that she is entitled to the special treatment of not going through the customary police procedure. Rivera accused Ressa of being an expert in media hype and victim internalization. She portray herself as the oppressed, at the expense of the truth. She was foolish enough to try an illegal scheme to outsmart the SEC and the BIR, but when she was called to answer for her violation, she is claiming that she was a victim of legal harrassment. If the government is really as bad as she claims it to be, she could’ve been sent straight to jail from the airport. The fact that she was able to post bail, only means that the legal justice system in the country is working fairly. Ressa’s lies, who have been accepted hook, line, and sinker by foreign media without even verifying the truthfulness of them, will do our country more harm. It will paint a bad image to foreign investors, and our economy will suffer, no thanks to God’s gift to Philippine journalism, Maria Ressa of Rappler. Again, those who worship Ressa for being a no non-sense journalist will have to think again of their adulation. This a such a misleading statement. First, she was fingerprinted as an ACCUSED and not as a criminal. If she was fingerprinted as a criminal, she would have to go to jail after the fingerprinting and not the other way around. She filed for bail because there was a warrant of arrest but she has the right to bail and yes, the presumption of innocence. And FYI, when Rappler printed a story accusing me of being a paid blogger by Duterte, they never interviewed me. Hence, there was no presumption of innocence by Ressa and Rappler. They accused me of corruption without the benefit of my side. Good thing, our laws are not like Rappler. Second, everyone who is accused of an offense get to be fingerprinted. No one is exempt even the innocent ones. 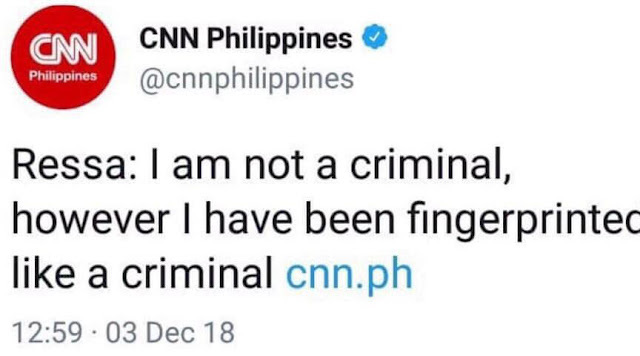 So by saying that she was fingerprinted as a criminal, Ressa is saying, she should not be fingerprinted as an accused. And yet you claim you are harassed and singled out by the government and have this sense of entitlement to demand a special treatment of fingerprinting when all persons accused of offenses go through the piano ceremony. Third, this bolsters my initial claim of media hype-victim internalization. Just because you have such beautiful hands (assuming that is her real hand), you just want the world to see you as the victim at the expense of truth. When in truth and in fact, the verdict is still out if you are a tax evador or not. Yes, we presume innocence because that is presumption juris tantum but that can be rebutted by proof beyond reasonable doubt. And by allowing bail, it is proof enough that our legal systems are working. If Duterte wanted to liquidate you or even ridicule you, he would have you arrested at the airport. Remember Kashoggi? He was not evem allowed bail. He just entered an embassy and never came out. There is a bad habit by media and its called pandering. We tell a story with the purpose of selling the story even at the expense of the truth and without regard as to the effect on the Philippines. I am not visiting the Philippines and forget about investing there. It is bad to be fingered like a criminal but its worse to be fingerprinted like a criminal.